A trip to New York during Fashion Week means fighting for elbow room at martini bars and stumbling across dozens of photo shoots at every turn. It doesn't usually mean a brand new laptop bag designed to make high tech travelling a little bit easier. 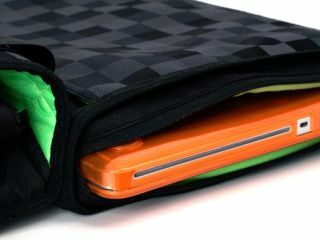 Launched amid the usual designer nonsense is Speck's Corepack Fly messenger bag, complete with a computer compartment that separates and lies flat for high-speed security screening. While stopping short of promising that you'll breeze through the metal detector in seconds, Speck does describe the Fly as the "one of the most TSA/airport checkpoint friendly notebook bags" on the market, meeting 'strict' US standards. It fits notebooks up to 15-inches in size. The laptop compartment also has a side zipper so you can slide out your netbook to enjoy over-priced in-flight Wi-Fi without removing the bag from the overhead bins. Other features include extra-plush micro-fleece padding, media player storage pocket with headphone cord pass-through, comfortable and durable adjustable seat-belt style nylon-webbed shoulder straps and lots of little pockets to help you forget where you put your passport. At least one aspect of the Fly is properly at home at Fashion Week - it comes in two indecipherable colour schemes: Speakeasy Grey Pinstripe and Restart GrayScale Pixel. See how they spelled 'grey' in two different ways there? Very international, darling. It's out in the US now for $90 (£55).